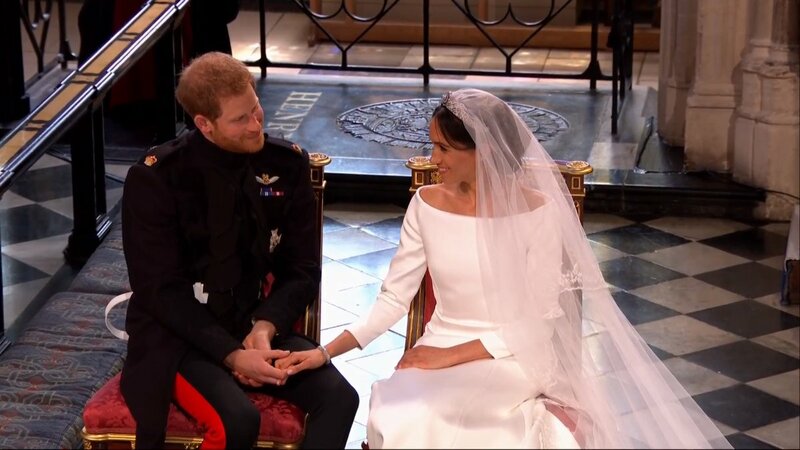 Meghan Markle and Prince Harry wed in glittering ceremony! 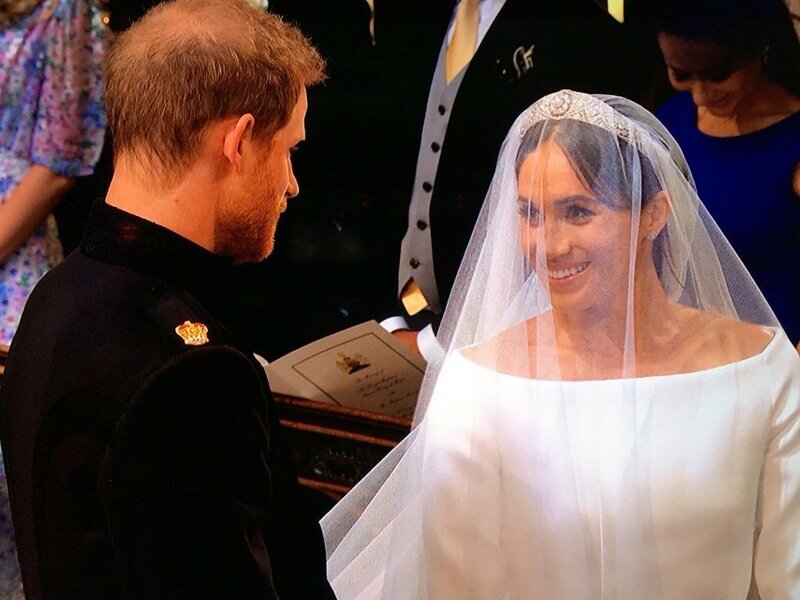 It is the day of dreams coming true and believing that fairy tales do exist as His Royal Highness Prince Harry weds US Actress Meghan Markle. 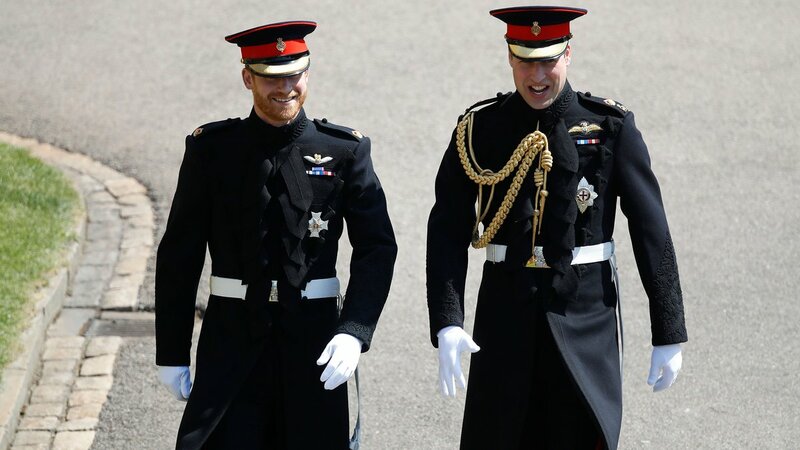 The two were set up as a blind date by friends and since then there was no looking back, and Prince Harry is said to have instantly fallen in love with Meghan. 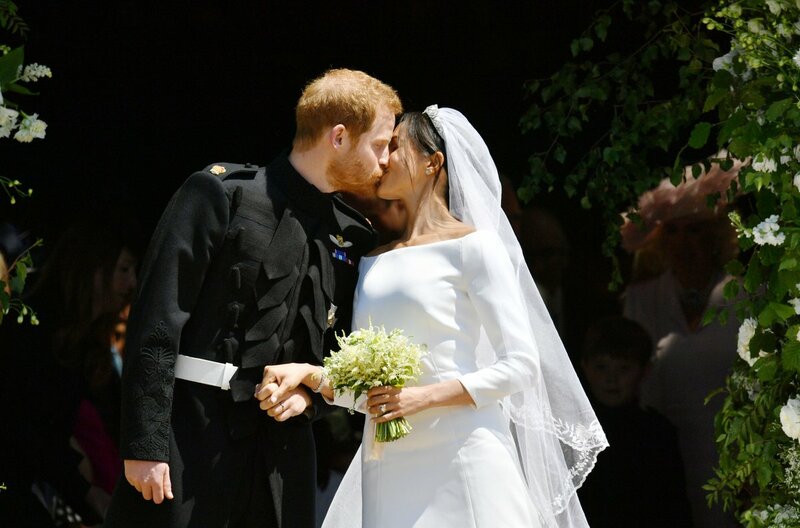 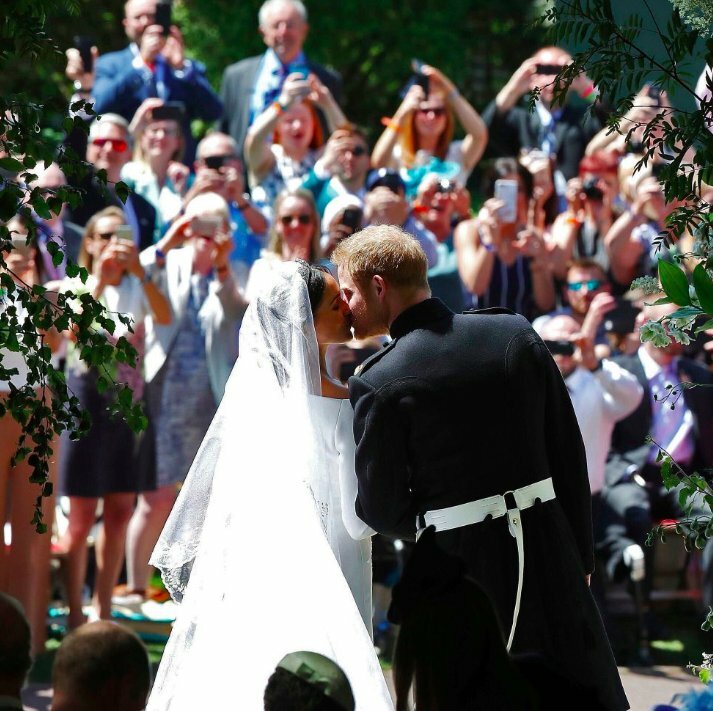 The couple weds at St. George's Chapel in Windsor, which has been adorned with flowers from the Royal Garden, chosen to the likes of Meghan Markle. 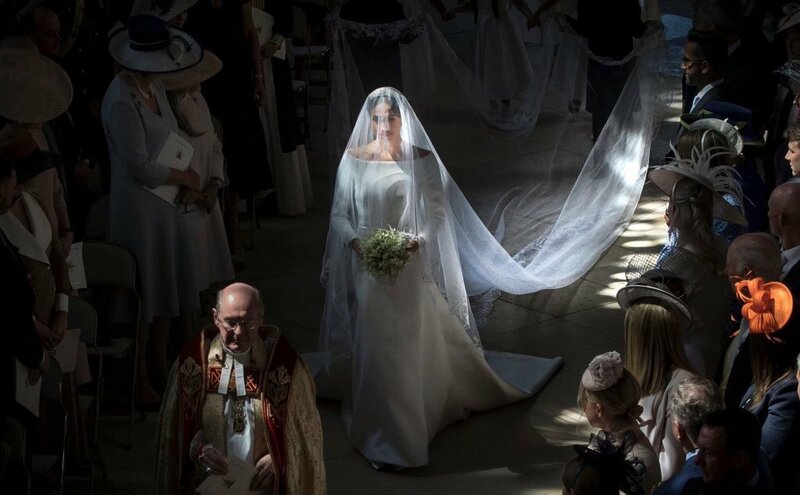 Meghan, 36, walked underneath a cloud of gorgeous white flowers, and sure does make a stunning bride clad in a breath-taking gown by acclaimed British designer Clare Waight Keller for Givenchy. 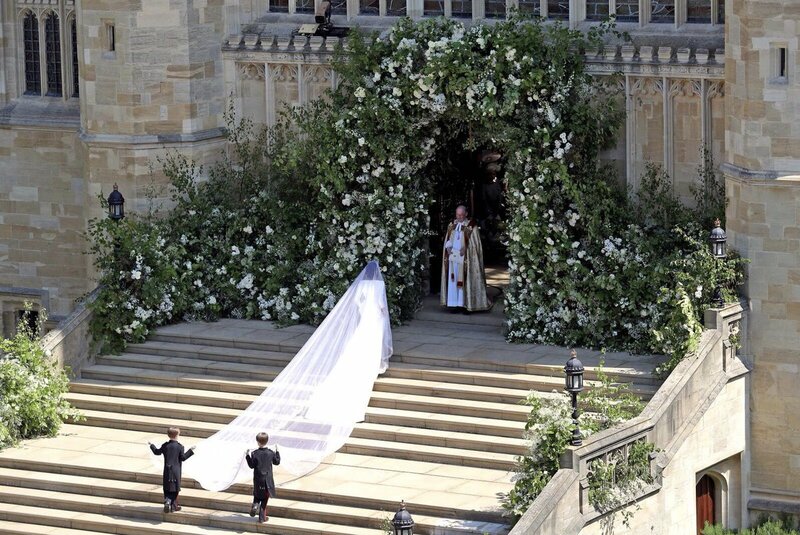 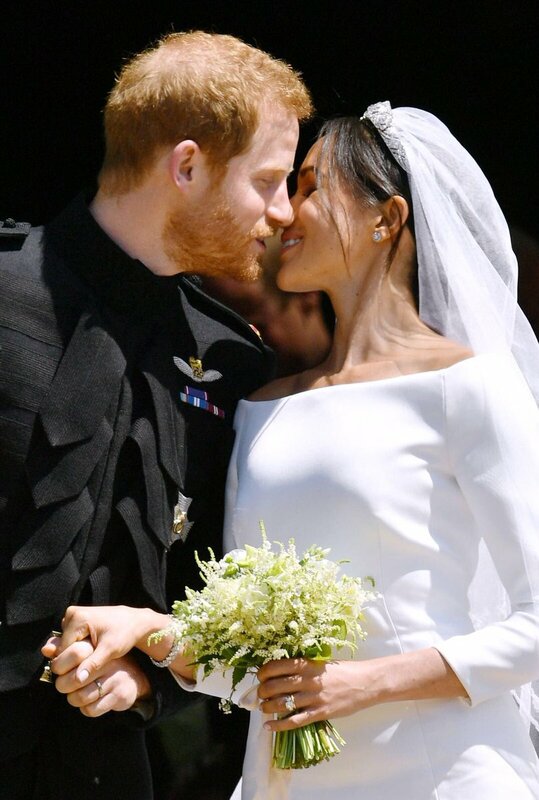 The 'Suits' actress chose to wore a Ralph & Russo Couture gown for her Official Engagement Photographs, and as she arrives to the chapel in Givenchy, one cannot keep eyes off the beautiful bride. 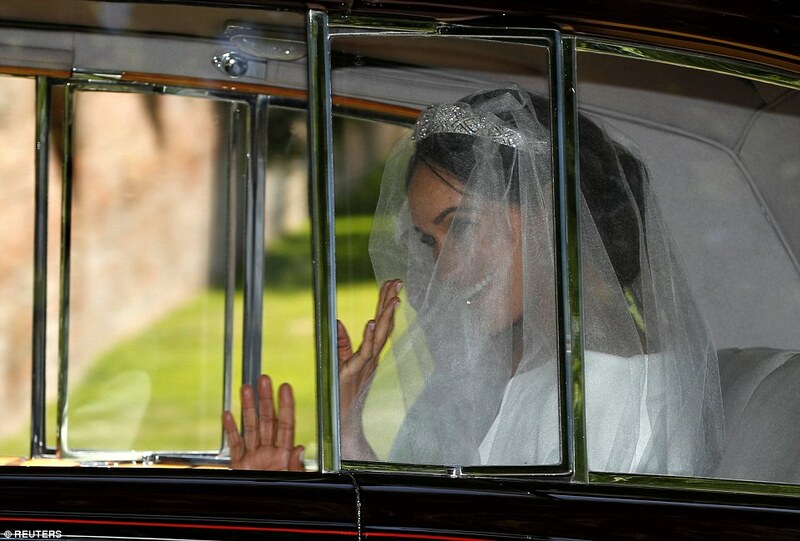 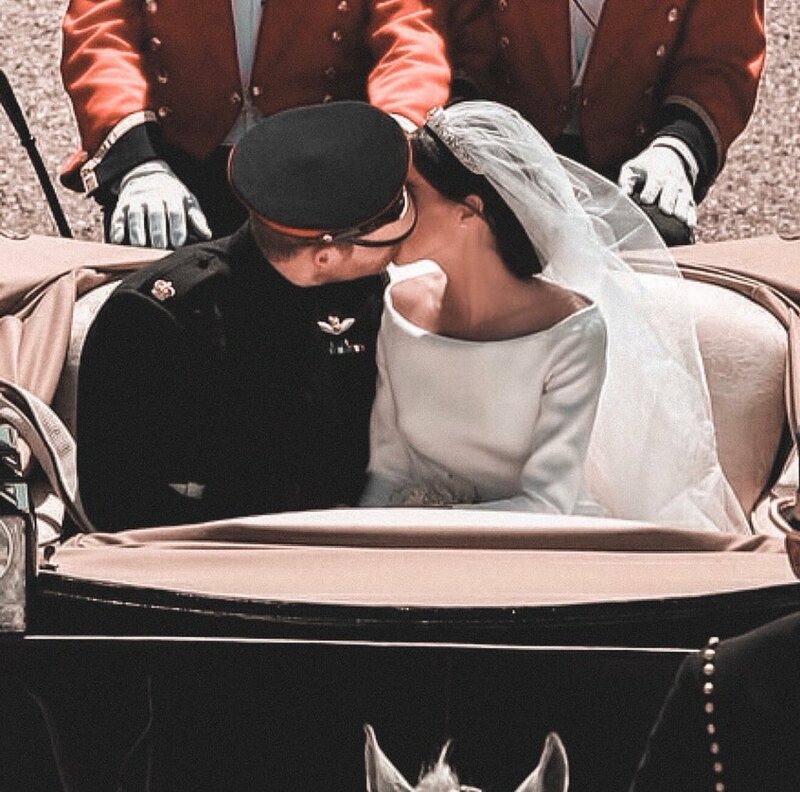 Meghan's white wedding gown features a traditional veil that covered her face upon her arrival, and the star also wore a stunning diamond encrusted tiara, with her brunette hair up in a neat updo. 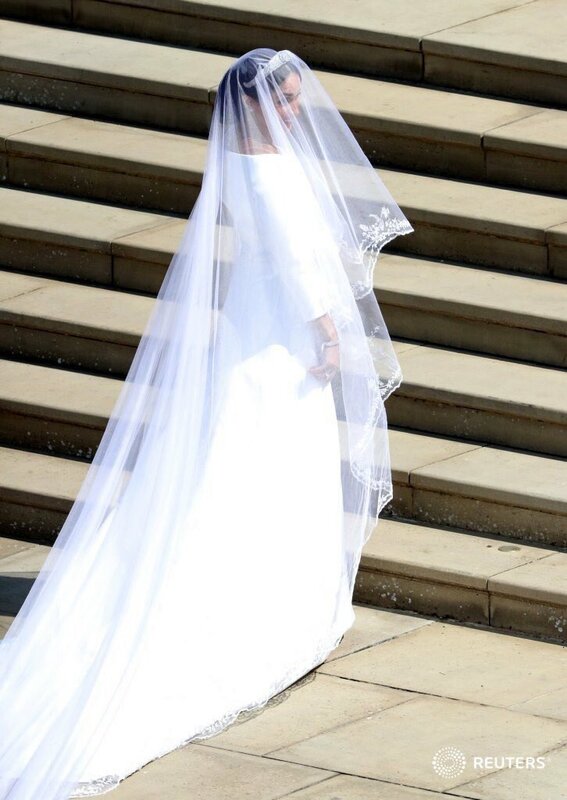 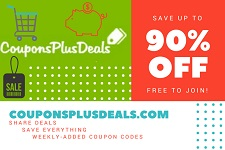 The bride's dress is a sleek and sophisticated ensemble that beautifully frames the physique, and Meghan sure does look splendid in the attire which also features a wide boat neckline. 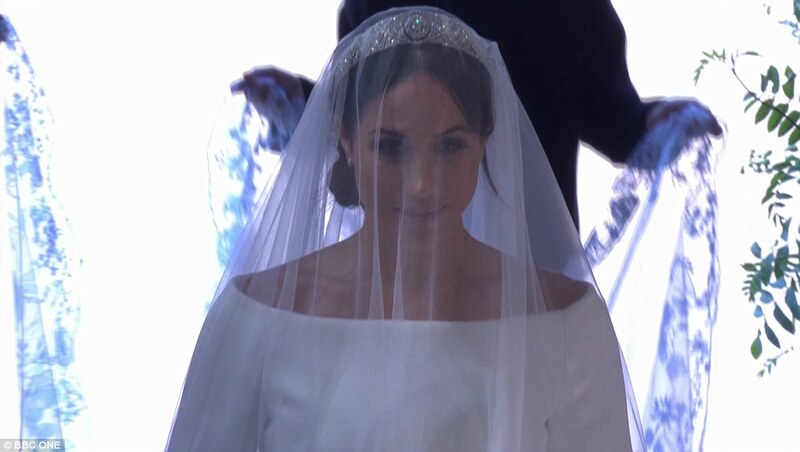 The tiara that Meghan has worn is Queen Mary's diamond bandeau tiara lent to the bride by the Queen, and the veil of the dress features the distinctive flora of each Commonwealth country united in one spectacular floral composition. 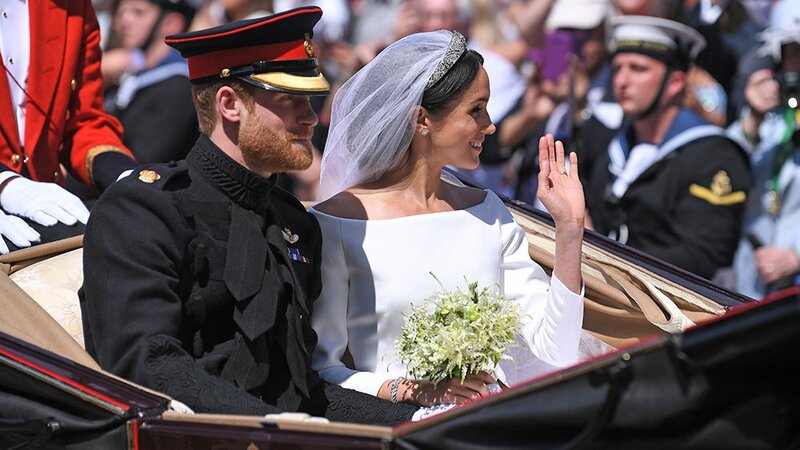 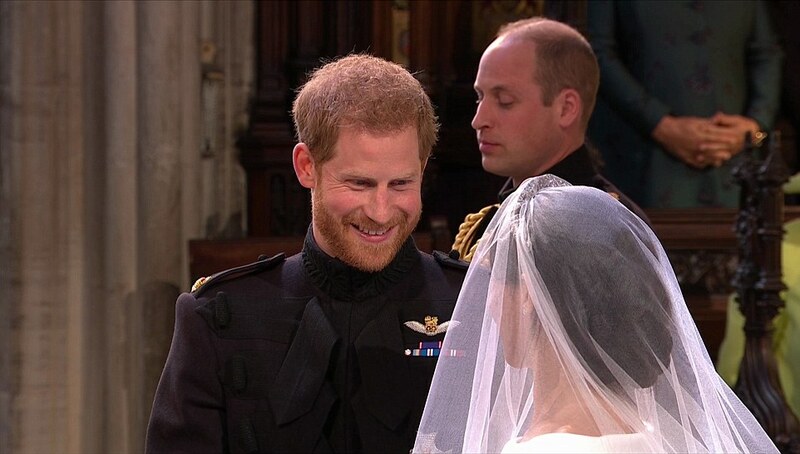 The Duchess of Sussex also carried a small bouquet of flowers as she walked down the aisle accompanied by Prince Charles, and her entourage of little bridesmaid and page boys, with her makeup her makeup look a simple understated flawless. 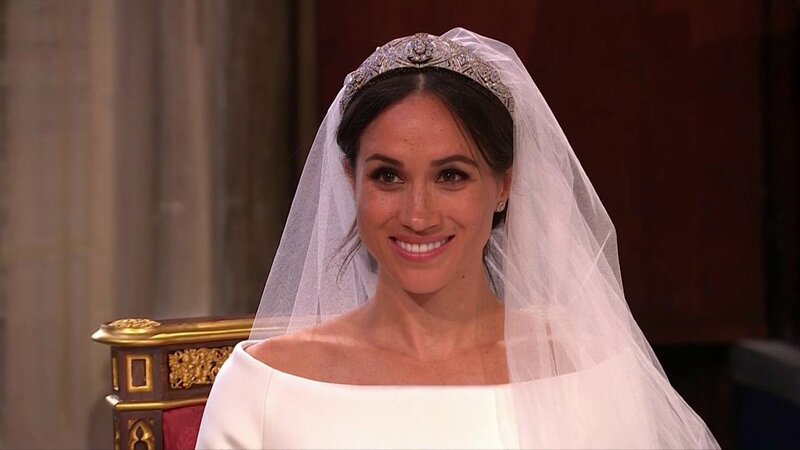 The bride also kept her accessories minimal, opting only for a pair of diamond stud earrings to go with her diamond tiara. 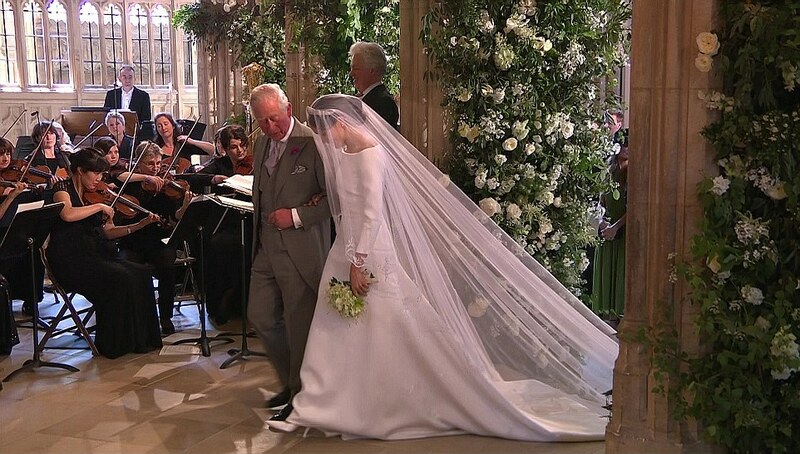 As Meghan's troubled father backed out of the wedding, the star requested the Prince of Wales, Harry's father Charles to walk her down the aisle, who did so, walking half-way down the altar with her. 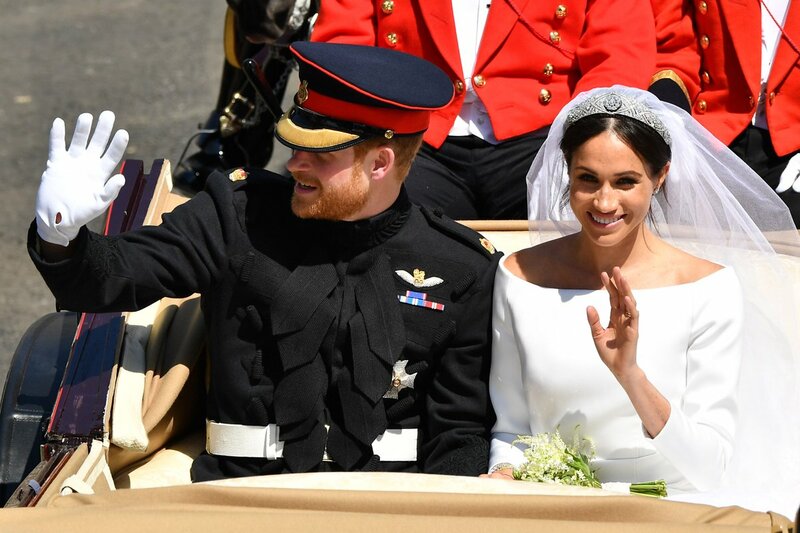 Harry and Meghan have been gifted the titles the Duke and Duchess of Sussex by the Queen, and the Queen also gifted the Welsh Gold out of which Meghan's wedding ring is crafted. 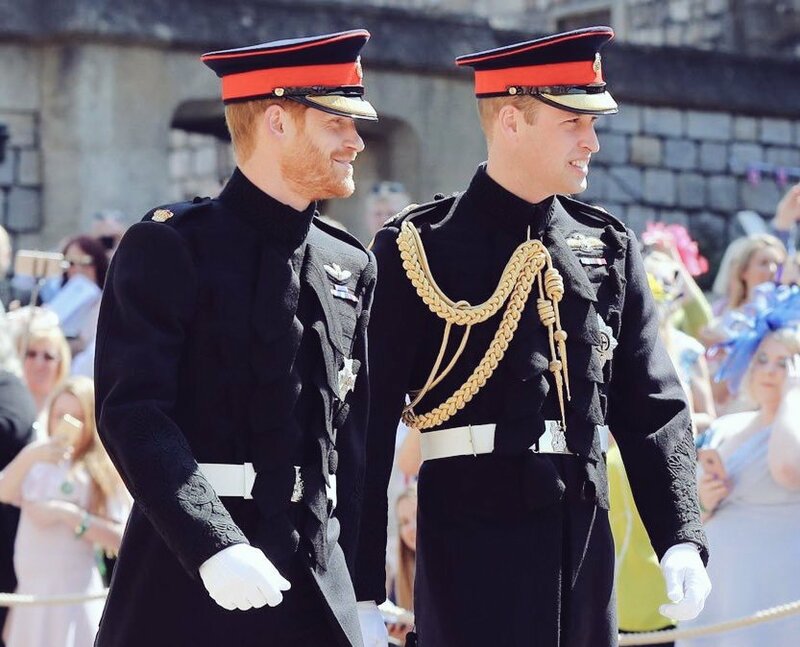 Harry's ring is a platinum design with a textured finish, and the rings will be carried by the Best Man Prince William, and both rings are designs of Cleave and Company. 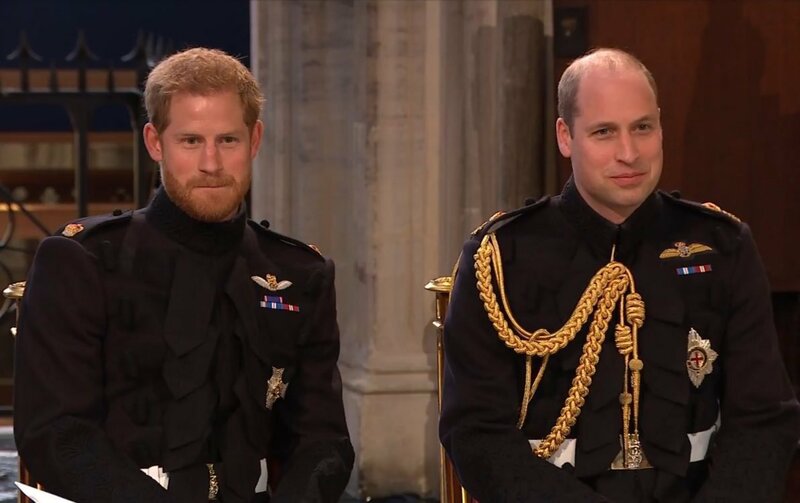 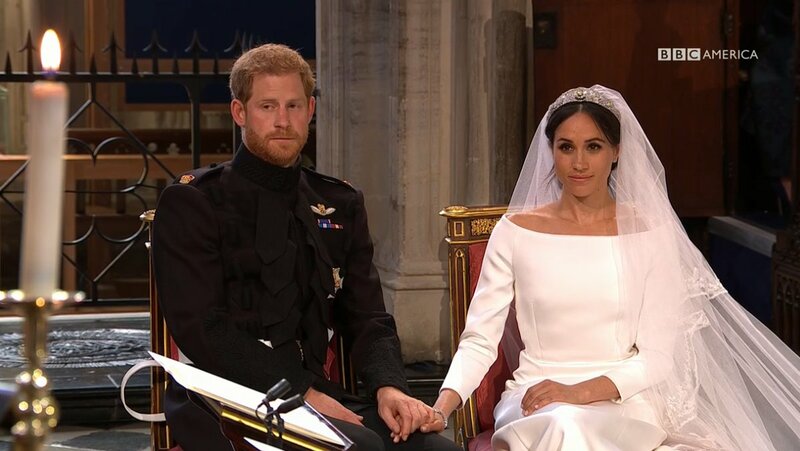 Harry's title of dukedom is of the highest rank in the British peerage, and Harry becomes the first Duke of Sussex in 175 years, and Meghan, the Duchess of Sussex for the first time in history. 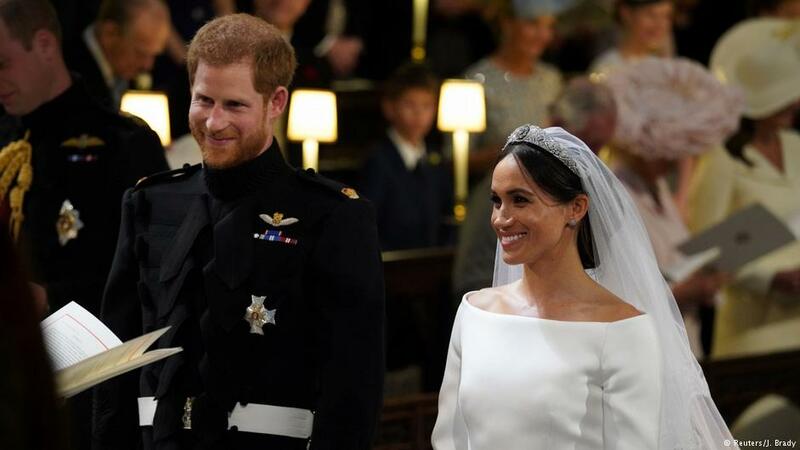 The Queen has also gifted new Scottish and Northern Irish titles to Prince Harry, the Earl of Dumbarton and Baron Kilkeel, making Meghan the Countess of Dumbarton and Baroness Kilkeel. 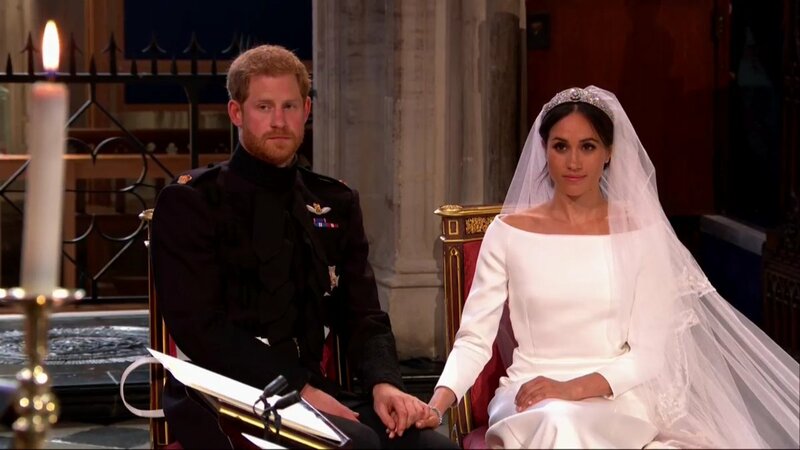 When present with Harry, other royals like Prince Andrew and Princess Eugenie and Princess Beatrice will have to bow to HRH the Duchess of Sussex Meghan Markle. 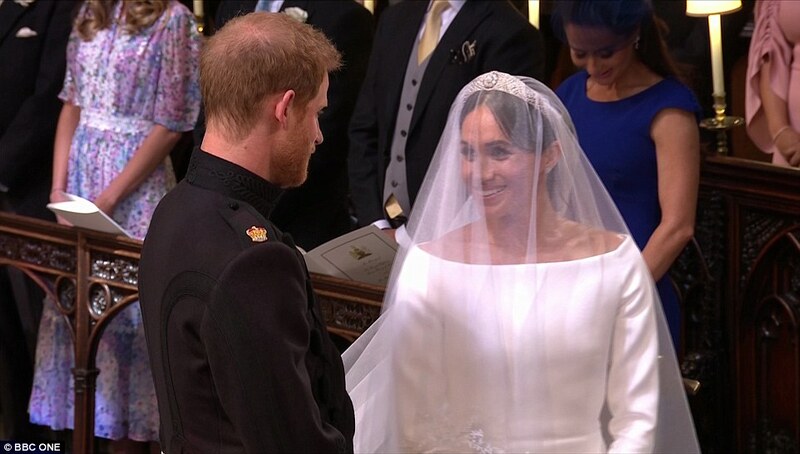 The wedding ceremony is also a day of dreams, with performers including Elton John, who sang the famous 'Candle in the Wind' at Lady Diana's funeral. 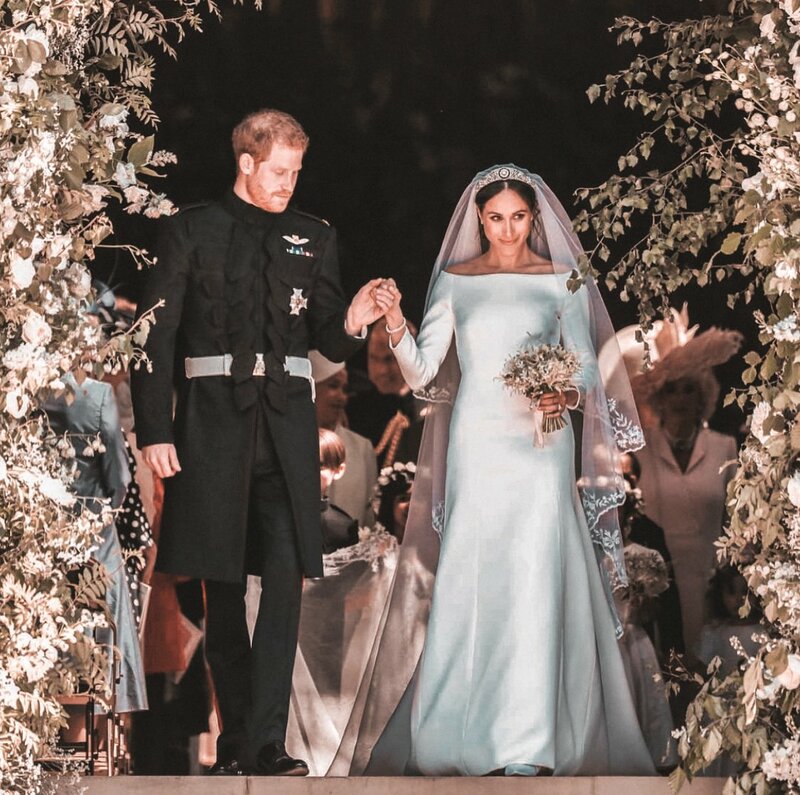 A number of Meghan's famous colleagues from the entertainment industry are also attending the star-studded wedding including her Suits co-stars, Amal Clooney and George Clooney and James Corden among many more. 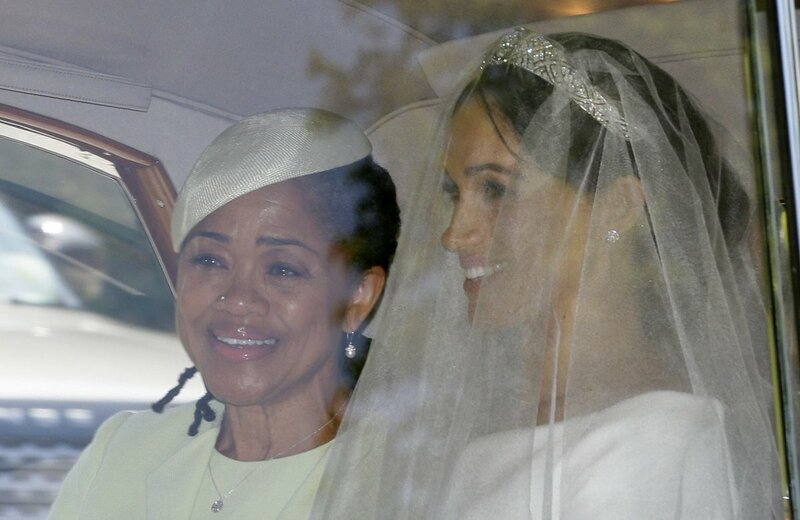 The service at St. George's Chapel will be followed by a gathering hosted by Prince Charles, and Meghan and her mother arrived to the chapel in a Rolls-Royce Phantom IV, which was used by Kate Middleton too for her wedding. 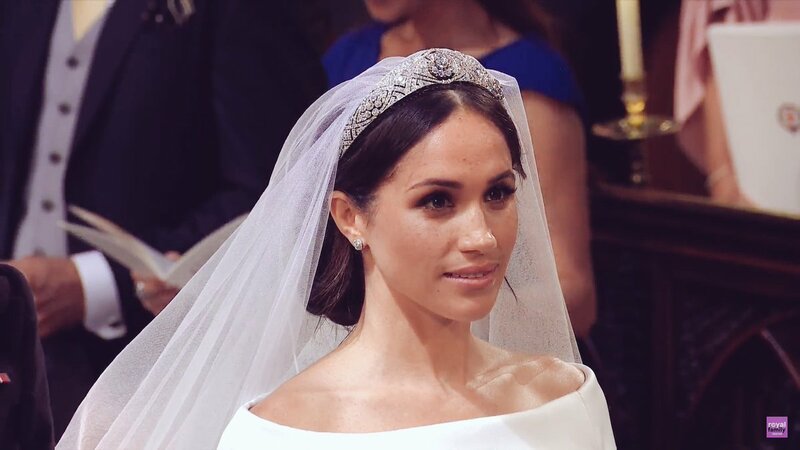 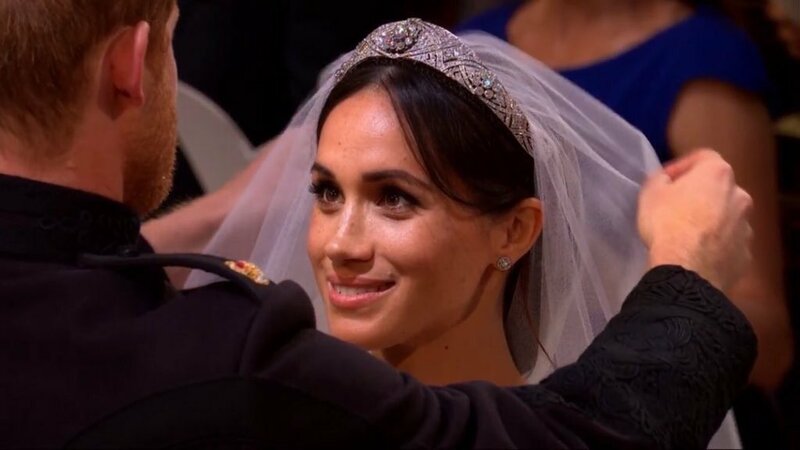 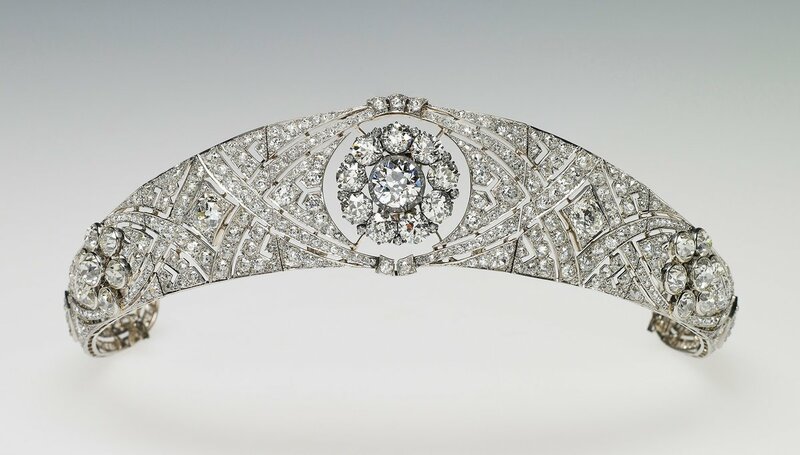 Meghan Markle wore Queen Mary's diamond bandeau tiara, lent to her by Queen Elizabeth II, at the Royal Wedding. 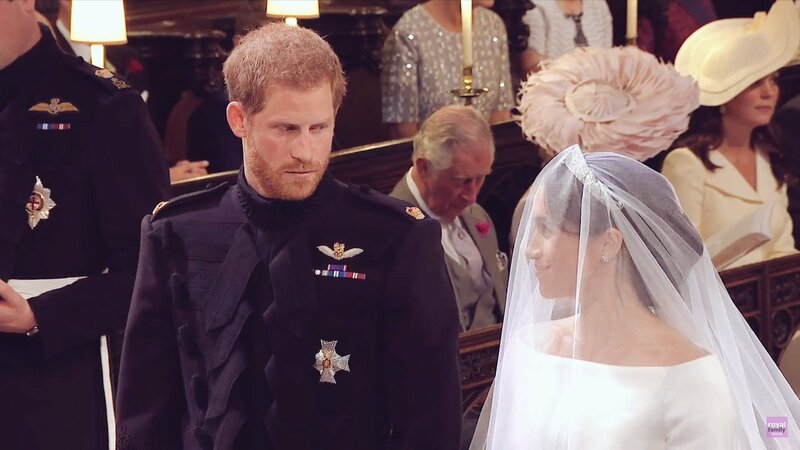 My Face Hunter: Meghan Markle and Prince Harry wed in glittering ceremony!